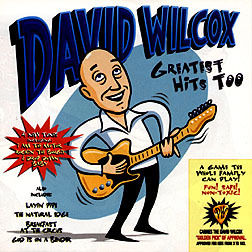 CD Review: David Wilcox, "Greatest Hits Too"
I have a lot of trouble getting excited about this album. Maybe you have to be a David Wilcox fan. They just have be some of them out there somewhere -- how else do you get to put together a second greatest hits package? It's all a bit scary, though. Especially when those greatest hits include "4 new tunes." Is there some kind of prescience that I don't understand at work here? Or is it simply an act of desperation? A lot of the lyrics seem sophomoric -- "I used to spend my money and tried acting funny until I hit my nose on the ground" -- or maybe moronic -- "The bartender is the man in the moon, I really want to get back there soon." Like I said, it's hard to get excited. The vocals aren't much better. My initial reaction was that they're boring, but "monotonous" seems more accurate. They just don't change much and, while there are songs that style works for, like "God is on a Bender," there are a lot of songs for which it doesn't. The big disappointment is that Wilcox and his various band members have a ton of musical chops, which helps explains his notoriety (they must be great, live). But they deserve to be juxtaposed against a better voice and better lyrical content. Whatever. For fans of "The Natural Edge," "Breakfast at the Circus" and "Layin' Pipe," and soon-to-be fans of "I am the Motor," "Rockin' the Boogie" and "Drop Down Baby"... enjoy!